Product information "19-inch rack installation slot for Octopus NET V2 / MC"
The rack installation slot for 19 "server racks for slots with 1U for mounting the Octopus NET v2 models. The installation slot is designed for holding 3 Complete Octopus NETs v2 or Octopus NET MCs with full equipment. The Octopus NET is fixed on the mounting points for wall mounting on the installation frame. For power supply the normal AC adapter of the Octopus NET can be used, this will also be attached to the mounting frame. 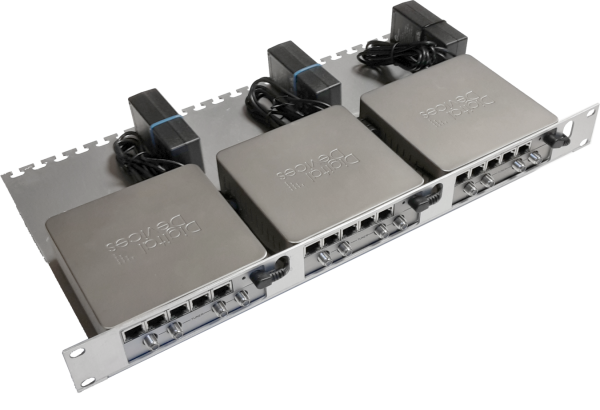 The Octopus NETs can be installed on the mounting frame so that either an access to the tuners and network switch or CI slots are accessible through the front openings. Necessary mountingmaterials for installation in a rack and for attaching the Octopus NET are included. Note: The 19-inch rack installation slot is compatible with the housings of the Octopus NET v2 and MC models. The models of the Octopus NET v1 can not be used here. Related links to "19-inch rack installation slot for Octopus NET V2 / MC"